My good friend Jim Fallows, national correspondent for the The Atlantic, asked me to be part of a team to publish guest blogs while he is using the 'down time' to finish a book. I am assigned, with three other people, for this week. Attached is my first entry, which I am also distributing as a blaster. Clearly, the explosion of people power in Tunisia and Egypt caught the U.S. flat footed, and to date, has triggered only embarrassingly incoherent responses by our political leadership. If you doubt this, I urge you to watch this video of Shihab Rattansi’s interview of State Department spokesman P.J. Crowley on Al Jazeera, or read this report describing Obama’s empty platitudes on about the crisis in Egypt. The revolt shows signs of spreading. America’s “friends” in Tunisia and Lebanon have already fallen to democratic pressures; as I write this, Hosni Mubarak teeters on the brink of collapse in Egypt, and there is potential for a collapse in Yemen as well as in the Palestinian Authority. Of course, no one can reliably predict how an ongoing interplay of chance with necessity will unfold over the coming days and months. But a question’s unanswerability does not mean one should not think about it’s ramifications. Mr. Obama did not create the forces driving the Arab revolt. Indeed, the seeds were planted long ago, when myopic cold-war foreign policies began to oppose the democratic/nationalist aspirations of Mohammad Mossadegh in Iran and Gamal Abdel Nasser in Egypt in the early 1950s, and when we began to prop up reactionary regimes in the oil states, while winking at Israel’s illegal colonization schemes after the 1967 War. Obama did surprisingly little to fulfill the hopes and dreams he unleashed worldwide during the election of 2008. Moreover, he deliberately magnified them in the Arab world with his 2009 Cairo speech. But coupled with his continuation of America’s cynical policies to prop up tyrannical Arab regimes, and particularly his spectacular failure to rein in the illegal Israeli settlements in the so-called Arab-Israeli Peace Process in 2010, Mr. Obama may have inadvertently exacerbated the explosive combination of frustrated expectations and business-as-usual that pressurized the current eruption of resentment, anger, and alienation among the Arab people in 2011. I try to chat up our many European sailor friends as well as locals I meet to learn about their conditions, lives, politics, culture, etc. Just about every one I talk to is an ‘average joe,’ living somewhere along the lower two-thirds of the food chain. Conversations may be in pidgin and sign language, but I generally connect. Despite this microscopic point of view, I am confident Obama’s promise electrified people in Europe, Turkey, and the Arab world during his 2008 campaign. In fact, the impression he created boggled my mind. Once in a small shop in Syria, for example, a man of about 20, asked me in French, Syria’s second language, if I was French or English. I responded, pointing to my chest, saying slowly, ‘Aameerikaa.’ He broke into a huge grin, put his arm around me, and started chanting ‘Obama, Obama, Obama,’ while pumping a ‘thumbs up’ with his other hand, ending with a ‘high five.’. While this was an extreme example of the attitude, it was also typical in one sense: as soon as you said you were from the U.S., Europeans, Turks, or Arabs would start talking enthusiastically about Obama. The biggest leak of confidential documents in the history of the Middle East conflict has revealed that Palestinian negotiators secretly agreed to accept Israel's annexation of all but one of the settlements built illegally in occupied East Jerusalem. This unprecedented proposal was one of a string of concessions that will cause shockwaves among Palestinians and in the wider Arab world. I am a fan of the European Union, but the analysis, Can Europe Be Saved?, by Paul Krugman in the 16 January issue of New York Times Magazine, is a good summary of what is going wrong in the European project. The worldwide financial meltdown has pushed several of the EU members — Greece, Ireland, Portugal, and Spain to the cusp of a debt deflation, raising the specter of national bankruptcy. At the heart of the problem is the euro, and the inconsistencies resulting from the mismatch between monetary centralization and fiscal decentralization. There is simply no question that the progressive economic integration of the Western European countries that began with the Coal and Steel Community in 1950 has been good economically and politically for Europe and the World. But as Krugman shows, the adaption of a common currency — the Euro — in 1999 without a concomitant commitment to a unified fiscal policy set the stage for an inevitable crisis. Some observers, like my friend Marshall Auerback, have long warned about the problem posed by the mismatch between monetary and fiscal integration, but their dissents were lost in the enthusiasm of the rush to adopt the Euro. Add in the rapid expansion of the Eurozone to the east after the Soviet Union collapsed and the stage was set for trouble. The global financial crisis beginning in 2007 brought that problem to a head when sovereign debt crises emerged in several of the weaker EU members. Krugman explains well why options #1 and 2 are unsatisfactory as long term solutions, so, in reality, it seems to me that only his last two options offer a long term resolution to the crisis — Option #3 or monetary decentralization implies dumping the Euro as a single unified currency, allowing local devaluations, and in effect, returning to the EU status quo ante with some variation of national currency relations that existed in 1998, or Option #4, keeping monetary the integration but adding full fiscal integration. Moving backward is never attractive politically or intellectually, and Krugman explains the downside of Option #3 (as he did with Options #1 & 2). But he does not explore possible negative ramifications of Option #4. In effect, Krugman leaves the reader with the impression that full-scale integration would be the best — and perhaps the only — outcome over the long term. Full scale fiscal integration — effectively creating a United States of Europe — has long been the dream of many EU proponents, but it assumes all the EU members can move beyond the legacy of Europe’s fractious history: the memories of its wars and the deeply ingrained cultural differences among its peoples. If the people of Europe can not move beyond the remnants of this cultural DNA, the idealistic dream of a fiscal union could mutate into a nightmare. The model for that nightmare may well be a variation of what happened in Yugoslavia, where history and dormant resentments collided horrifically in the 1990s to unravel the union enforced by Marshall Tito. The resulting chaos created a pressure cooker in the Balkans not seen since the late 19th and early 20th Centuries. One could argue that some of the cultural differences between Serbia and Croatia, for example, were less than those between France and Germany, or between Sweden and Italy, or between the Netherlands and Spain, or between Denmark and Greece. Serbia and Croatia are populated by Serbo-Croatian people speaking the same slavic language. To be sure, Serbia and Croatia have different Christian religions Orthodox & Catholic) and alphabets (Cyrillic & Latin). But differences in religion and alphabet also exist in the EU. On the other hand, Serbia and Croatia had very different histories (but not so for Serbia and Montenegro). Serbia was part of the Ottoman Empire while Croatia was part of the Austro-Hungarian Empire. Western (particularly the northern) European countries also have different histories of being independent nation states that emerged out of feudalism (which enshrined the principle of reciprocal powers), with unique languages. The feudal and national experiences were been far less developed for the countries making up the former Yugoslavia, having been provinces ruled by multi-ethnic empires. Prior to its dissolution into civil war, Marshall Tito had forged a unified Yugoslavia into the most prosperous economy in the old Communist block, people were educated, and there was much intermarriage among nationalities. Indeed, Tito himself was half Slovene and half Croat. To be sure, he was a ruthless leader and a virtual dictator who used the whip hand to contain local animosities, but few people would have predicted that Yugoslavia would collapse into a violent civil war after Tito died. It is now clear that animosities remained beneath the surface, and one of the main factors breaking up Yugoslavia was the resentment on the part of the relatively richer Slovenes and Croats over having to transfer some of their scarce wealth to the relatively poorer Kosovars, Macedonians, Montenegrans, and Serbians. Those economic resentments (which were fanned by opportunistic outsiders as well as insiders in the 1980s and 90s) resurrected memories of past wrongs and atrocities, launching a downward spiral to disintegration, violence, and destruction not seen in Europe since World War II. No doubt, Tito’s death in 1980 and the loss of his organizing genius was a major factor in the loosening of the bonds holding Yugoslavia together. Significantly, there is no statesman of comparable stature to forge a fiscal federation out of the EU, much less to make it endure. And EU governments are democracies that ultimately respond to popular emotional pressures, like ethnic resentments and the “otherness” of people who are somehow different. I have spent 75% of my time living in Mediterranean over the last five years, and my conversations with many European friends, from all walks of life in both northern and southern Europe, make it quite clear to me that there is a widespread latent resentment among the inhabitants of the richer countries of the north over the the requirement to transfer money to relatively poorer countries in the South. That said, the overwhelming majority of Europeans from all parts of the EU favor the EU, and I would categorize these kinds of complaints as griping. I have seen no hints of threats or any tendency toward violence associated with these resentments. Until recently, it was common hear comments like, “It is a great time to be a European." There is no question that a new and very different Europe and a new Europeaness is evolving, but that very newness may make it vulnerable to too massive a change. The history of the EU’s integration from the the tentative steps taken in 1950, suggests a pathway of incremental change is best. Indeed, it was the jump to a common currency that became become a source of the most serious crisis facing the EU itelf. A full fiscal union would involve an even greater jump and a more drastic subordination of national identities than the monetary union. If significant minorities of people in the rich countries felt they were being treated unfairly by the imposition of a supranational authority, including the requirement to transfer funds to the poorer countries (via taxing and spending programs much like New Yorkers help to subsidize the poorer states in the south through the federal tax and spending system), opportunistic politicians may be tempted to fan the fires of national resentments by emphasizing the “otherness” of the poorer countries in southern or eastern Europe. This kind of demagoguery would be particularly potent during times of economic stress and insecurity. If you think this line of argument is too much of a stretch, given the postwar history of Europe, just look at the link between the fanning of resentments to the most recent incarnation of paranoid political extremism in the United States. Might a similar process put a political sequence of action and reaction into place that eventually intensifies to a level that kills the EU goose that laid the golden egg? Krugman ignores the implications of the dangers posed by this kind of interplay of chance and necessity in his assessment of Option #4. Had he considered them, Option #3, or retreating from the Euro (but keeping the customs union, open borders, free movement of capital and labour, and the harmonization of standards and regulations, etc), while painful in the short term, might look a little better when viewed over the long term. A return to a degree of sovereign currencies in an EU context (perhaps in some kind of form of tiered Euros, coupled with some quasi-fiscal coordination?) may pose a better chance for putting the EU political economy on a more sustainable evolutionary pathway toward integration over the long term. Moreover, given the already widespread use of modern electronic funds transfer capabilities ranging from ATM machines to international bond sales, the major inconveniences of working with separate currencies would be relegated to the past. Of course, as any veteran of Vietnam (or Algeria) will tell you, mines and booby traps are favorite weapons of guerrilla fighters. Mine warfare is extremely cost-effective for the guerrilla. It is dirt cheap, yet it creates a powerful hidden menace that slows down the adversary's battlefield decision cycle. That is because the real or imagined presence of mines increases uncertainty and fear, which turn the focus of a soldier's attention inward on self-protection, as opposed to maintaining a mental state focused outward on neutralizing the enemy. Defeating the mine becomes the objective, but the presence of mines and booby traps fix soldiers' attention and make them more vulnerable to the blind-side effects of enemy initiatives, like sudden hit and run attacks or ambushes. That combined-arms effect is why force protection has become such a obsession in Afghanistan. Ask any soldier what it is like to be been stuck in a minefield in any war, and he will tell you the dominant psychological effect is a sense of paralyzing fear and vulnerability. Put abstractly, the uncertainty and menace posed by the real or imagined presence of mines creates an intense psychological pressure that builds up a reactive emotional mindset that strains the body, saps initiative, and slows down decisions and action. In a relative sense, this effect on one side of a conflict increases the freedom of action for the other, in this case, the guerrilla. Despite the land mine's long indisputable history of high effectiveness, the US military was caught flat footed by the sudden appearance of this threat after the U.S. militarized its response to 9-11 with the invasions of Iraq and Afghanistan. Indeed, the Pentagon coined a revealing new mechanistic term of art to describe the mine threat: "improvised explosive device (IED)." The very wording of the term implies the battlefield booby traps in Iraq and Afghanistan were something new and unexpected to the planners in the Pentagon and strategists in the field. Despite the subsequent expenditure of billions of dollars to neutralize this threat, much of it wasted on high tech boondoggles and bizarre robotic gimmicks that benefitted program managers in the Pentagon, defense contractors, and the Congressmen whose districts benefited from the torrent of dollars, the combat effectiveness of the mine threat in Afghanistan has surged in parallel with President Obama's troop surge, according to the Pentagon's own casualty data. 1. A relatively mild winter enabled freer Taliban movements (presumably enabling Taliban guerrillas to deploy more mines in more places). 2. 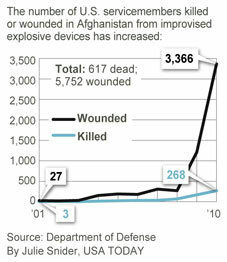 Increased mine-inflicted casualties are the result of added US troops forcing the Taliban to fight back. 3. Al Qaeda is directing the Taliban to return to areas they were pushed out of and to fight back. 4. Despite increased casualties caused by mines, the military says progress is being made against the mine threat. 5. Wounded troops are less likely to die because of improvements in battlefield medicine. Rationalization #1 may be true. So what? Rationalization #4 is vapid Pentagon-speak for justifying its continued expenditure of billions of dollars on hi-tech gizmos to defeat a primitive mine threat it failed to foresee, while it indulged itself by continuing to waste money on cold-war inspired turkeys after the cold war ended (Star Wars, F-22, SSN-21, Future Combat System, etc). Rationalization #5 has nothing to do with the total number of casualties from mines, i.e., killed plus wounded. Indeed, from the guerrilla's perspective, it is often better to wound an adversary than to kill him, because wounding triggers rescue operations that shift decision-making focus inward toward self protection and ties up more manpower and material resources in high-cost extraction/medical operations. Paradoxically, the increase in the wounded to killed ratio, while welcome to our side in the sense that it reduces US deaths, may even suggest that the relative effectiveness of mine warfare for the guerrilla is growing, because it is increasing its strain of our ever more costly efforts to wage an increasingly expensive and frustrating war is a distant land (we have now spent as much in Afghanistan, measured in inflation adjusted dollars, as we spent in much larger, albeit shorter wars in Korea and WWI and almost half as much as was spent in Vietnam). Rationalization #s 2 & 3 at least relate to the question of the effectiveness in coping with the mine threat, but they reflect a somewhat bizarre mindset when viewed in terms of our counterinsurgency doctrine. The idea of measuring success by forcing the Taliban to stand and fight suggests we have reverted to a Vietnam-style attrition strategy (which implies greater firepower, focus on bodycounts, and more unintended death and destruction to civilians), as opposed to the counter-guerrilla oil-spot strategy of winning hearts and minds of locals that the surge was originally premised upon. This weird aspect was reinforced by John Nagl, an oft-quoted "expert" on guerrilla warfare and president the Center for New American Security (a pro-interventionist thinktank), when he said "We'll know a lot more about how effectively we've been able to put pressure on the enemy based on who comes out to fight in the spring." By implication, Nagl is saying if that the Taliban don't come out to fight next spring, it is a sign that we are winning. Nagl is forgetting that the Taleban have disappeared before. In the immediate aftermath of the US invasion of Afghanistan in 2001, a triumphal President Bush and Pentagon mistook a strategic dispersal into the Hindu Kush for a rout and declared victory. Now, nine years later we are still fighting the Taleban, which in fact have expanded their areas of control. Yet Nagl would have us believe another disappearance, by itself, would be a sign of success. T. E. Lawrence (of Arabia), would have different take on Nagl's disappearing hypothesis, arguing instead that guerrillas may not choose to cooperate by standing and fighting, because the art of guerrilla war is "tip and run, not pushes but strokes", with "use of the smallest force in the quickest time at the farthest place" and "never being on the defense except by accident or error." Lawrence is saying the name of the game for the guerrilla is to wear the adversary down by stretching out the war. Mine warfare fits this game like a hand in a glove. Lawrence is certainly not alone in this kind of thinking. Nagl and his fellow counter-guerrilla travellers in the Pentagon would do well to study William E. Polk's profoundly important book, Violent Politics: A History of Insurgency, Terrorism, and Guerrilla War, from the American Revolution to Iraq (Harper Perennial, 2008), because Polk explains quite clearly why the only combatants to benefit strategically from protracted war of insurrection are the guerrillas who are trying to expel foreign invaders — and mine warfare is good for protracted war. Budget time is always the silly season in Versailles on the Potomac, but for the last several years, the Pentagon has had to settle for inflating the threat posed by a small number of deranged terrorist fanatics, in part because it was the only threat inflation game in town. That may now be changing, thanks to some grainy photos of the humongus J-20 Chinese steath fighter making its rounds in the aviation geek community, particularly in aviation publications in the US and thinktanks in Australia. The J-20 was just rolled out and may have made its maiden flight, but we know almost nothing about it. No Problem; in fact the uncertainty is good for business. Indeed, the photos plus the uncertainty are manna from heaven for the threat inflators at Aviation Week and the Military - Industrial - Congressional Complex, as my good friend Andrew Cockburn decribes today in the L.A. Times (also attached below). Andrew knows of what he speaks, having authored the classic exposé of how we grossly inflated the Soviet threat during the Cold War -- i.e., see The Threat: Inside the Soviet Military Machine (Random House 1983). Andrew decoded the Soviet meltdown well before its collapse and long before the intelligence community began to sense that the inflated Soviet Union threat was evaporating into emptiness (an awareness that gradually washed over our threat-inflating spooks after the Soviet Union had in fact collapsed). During the 1990s, the Pentagon struggled futilely to come up with what it euphemistically called a "peer or near peer competitor" -- first in some form of a reconstituted Soviet Union, then an emergent China (a particular favorite of Hill Rambos like Senator McCain), and then the need to simultaneously confront a combination of two major regional competitors (Iraq, Iran, N. Korea, etc.). Of course, no one, except a few outspoken marginalized intelligence analysts, paid any attention to Osama bin Laden (because inflating the terrorist threat was simply not workable option as a serious budget inflator), until 9-11 sufficiently terrified the American people and broke loose the uncritical spending psychology needed to lever the huge spending increases for the cold-war inspired weapons that were already in the out-years of Pentagon's computers before 9-11 (see Slide 1 in my last congressional testimony here). Now with the Global War on Terror running out its string, the public going wobbly on Afghanistan, and with the most serious domestic economic crisis since the Great Depression threatening cutbacks in future defense budgets, the Big Green Spending Machine desperately needs to inflate some kind of emerging threat that lies in the unknowable future -- so that it can sell the magic shake oil of fear and uncertainty that worked so well during the Cold War. Happily, the J-20 fits the bill -- with J-20's magic coupled with a latent insecurities stemming from China's stunning economic growth, together with the help of threat inflators in the media and aviation geeks world wide, the grainy photos of J-20 will be used to "prove" China has embarked on a military expansion that will make it a peer competitor or even better, let us pray, a super power threat in the unknowable future. And then, like a cargo cult's vision of manna from heaven, the money will rain down on Military - Industrial - Congressional Complex, and Eisenhower's nightmare will continue unabated. At least Andrew understands what is going on. Read his op-ed and weep, because it is your social security and medicare that will pay the bill. The warplane could be decisively superior, some experts have said. But another arms race is unnecessary, especially over a plane whose capabilities are untested. Is the Global War in Terror Creating More Problems than it is Solving? The late historian Chalmers Johnson popularized the term "blowback" to describe the unintended grand-strategic consequences resulting from interventionist foreign policies and military actions. The term blowback dates to the CIA's internal history of the US’s 1953 Iranian coup that threw out the Iran's democratically elected Prime Minister Mohammed Mossadegh (a progressive social reformer who wanted to nationalize the oil industry among other things) and replaced him with the tyrannical American puppet Shah Mohammed Reza Pahlevi. No one can doubt that contemporary problems with Iran today are rooted in resentments dating back to the 1953 coup. The United States reacted to the murder of 3,000 Americans on 9-11 by declaring a Global War on Terror (GWOT) and militarizing its response to what was in fact a heinous crime committed by a conspiracy of Moslem fanatics and nut cases. Treating this criminal conspiracy as an act of war has justified the invasions of Afghanistan and Iraq as well as unilateral attacks in Pakistan, Yemen, Somalia and elsewhere, as well as a suspension of constitutional rights at home. Moreover, like the notorious Phoenix program rising from its Vietnam ashes, military strategy in the GWOT has devolved into the targeted killing and assassination of what the Pentagon likes to call "high value" targets. In the process, hundreds of thousands of innocent Moslems have met their deaths, either as direct or indirect consequences of our reaction to 9-11, and millions of Moslems have become convinced the US is engaged in a religious war with Islam itself. That these are unintended effects of a targeted killing strategy aimed at the Al Qaeda conspiracy and its fellow travelers is quite beside the point as far as the spreading anti-American Islamic rage is concerned. Nowhere is the danger of blowback greater than in nuclear-armed Pakistan -- a multi-ethnic Islamic nation of 180 million people that is now in the cross hairs of our killing strategy in the GWOT. President Obama may forbid the use of term "Global War on Terror," but his "whack-a-mole" attacks on "high value" targets inside Afghanistan's and Pakistan's predominantly Pashtun territories is indistinguishable logically as a military strategy from that of his predecessor. Moreover, Mr. Obama has chosen to massively escalate the "targeted-killing" drone strikes inside Pakistan, despite mounting evidence that these strikes are fueling anti-America rage and the recruitment of Pakistani Jihadis. According to a data base maintained by the New America Foundation, President Bush launched 33 drone strikes in five years between 2004 and 2008. In the two years since he took office, President Obama has launched 174 drone strikes. Unfortunately, as I indicated an earlier blaster, Mr. Obama's strategic review turned inward on itself and failed account for the five crucial grand-strategic criteria by which any military strategy should be judged. The attached op-ed in the Observer explains why a continuation of business as usual in Afghanistan and Pakistan could blow back on itself in Pakistan as well and push that nuclear-armed state into chaos. The assassination of Salmaan Taseer has shown only too clearly the growing extremism in Pakistan, the radicalisation of its society and the polarisation that is taking hold. This is not just between the religious and the secular, but also the polarisation that the "war on terror" has caused between the various religious sects. So after 9/11, when General Musharraf chose to ally with the Americans in the "war on terror", it was a fundamental blunder. Overnight he turned the jihadi groups created to fight foreign occupation from supporters into enemies, people prepared to fight the Pakistani army because of its support for the US invasion. Musharraf then made a second mistake in sending the army into the tribal areas. Our own tribespeople immediately rose up in revolt. Rather than co-opting these people – and, remember, every man is armed – we made new enemies. Then along came the American drones to kill more of our people. Soon, the American "war on terror" was seen as a war on Islam by the majority of Pakistanis and certainly by the Pashtuns in the tribal areas. Terror and extremism intensified. Every year extremism gets worse, our society becomes more radicalised and the bloodshed grows. This is how you must see the context of this assassination. Society is now so polarised that because Taseer criticised the blasphemy law he was seen as criticising Islam. But that was not what he said. This assassination would not have happened before the "war on terror". Imams of different sects are being killed now, and mosques and churches bombed. The fanaticism keeps getting worse. As disturbing as Taseer's assassination is, just as disturbing is the way his assassin has become a hero. That is why this whole thing is so dangerous, it shows where we are headed. I have been predicting this from day one. There is no military solution in Afghanistan, only dialogue, so the supreme irony is that in siding with the Americans all we have done is send the levels of violence up in Pakistan. The "war on terror" has weakened the state and then, thanks to the George Bush-sponsored National Reconciliation Ordinance in 2007, which allowed an amnesty for all the biggest political crooks, we now have the most corrupt government in our history. The "war on terror" is destroying Pakistan. Clemenceau once said: "War is too important to be left to the generals." He was right; for us it has been a disaster. There is incredible anti-American sentiment here, and the drone attacks only fuel that hatred. We need a change of strategy, otherwise the worst-case scenario will be achieved here; an unstable nuclear state. It's not a question of there being no room for moderates, it's that moderates are being pushed towards extremism. Taseer didn't say anything anti-Islamic, he just questioned the blasphemy law and whether it should be used to victimise innocent people. His death has caused many moderates to think there is no point in being a martyr. If it makes people such as myself think twice about what we say, then where does that leave us? We are all now at risk. Crime in Pakistan is now at a level that breaks all records. Yet 60% of the elite police forces are now employed protecting VIPs. Where does that leave ordinary people? Young Pakistanis are being radicalised and the Taliban grow in strength. The US is no longer fighting just the Taliban, it is fighting the whole Pashtun population. The consequences for Pakistan, with its population of 180 million, are enormous. And there is an impact, too, on Muslim youth in western countries. Graham Fuller, the CIA chief of staff in Kabul, wrote in 2007 that, if Nato left Afghanistan, Pakistan security forces could overcome terrorism and extremism. But, as long as the Americans push Pakistan to do more in the tribal areas, the situation will worsen – until Pakistan itself implodes. Raised the odds for success? Four more year versus 2011? Consider please the unexamined ramifications of these words. Three days earlier, a report in the New York Times by Alissa Rubin described internal frictions — particularly the disagreements over withdrawal timelines — affecting President Obama’s strategic review of Afghanistan. While Ms. Rubin’s also did not explore the grand-strategic implications of these frictions, her reporting brought a murky situation into sharper focus: namely, the incompatible goals of senior decision makers are now paralyzing decisive action and exhausting US efforts. President Obama understands now, if not during the election of 2008, that Afghanistan is a millstone around his political neck. He must at least appear to be beginning an exit from Afghanistan before the 2012 election. To do this in a persuasive way, he must create something that looks enough like success to enable a meaningful reduction in to begin in July 2011, without looking like he is leaving in defeat. The US Military players, especially General Petraeus, but also the military services, the Defense and State Departments, as well as the NATO bureaucrats (who are trying to preserve their anachronistic institution) want to stay in Afghanistan until they can concoct their own appearance of a military success, but they are not saddled with an election in 2012. So, they stretched the deadline to 2014 and will no doubt stretch it again, when necessary. Nevertheless, General Petraeus also knows that time is running out, so he has moved away from the slow-moving (and ineffective) “hearts and minds” to a so-called counterterrorism strategy. To this end, Petraeus has increased his reliance on what the Pentagon euphemistically calls “kinetic operations”. In particular, he has escalated the violence by increasing the targeted killing strategy — e.g., many more drone strikes in Pakistan and many more intrusive special forces’ raids in Afghanistan. Petraeus has also taken a page out of the Israelis’ play book by copying their scorched-earth home-demolition tactics, which as Gareth Porter has shown in an extremely important report, “Gains in Kandahar Came With More Brutal US Tactics.” But as Porter argues, correctly in my opinion, this tactic will blow back on itself to exacerbate our strategic weakness, because it will enrage the xenophobic rural Pashtuns in the southern Afghanistan and increase their will to continue the war. Obama’s strategic review revealed at least four salient factors undermining our grand strategy. The first is that the exit goals of the political and military leadership in the war effort are in conflict with each other. To make matters worse, both sets of goals are focused inward on the decision makers themselves as opposed to being focused outward on the adversary in the external environment. Both are political and symmetrical in that they are aimed more at saving careers and reputations than at achieving military success. But there is more to the horror story. Given the extreme divisiveness and inward focus that is now gripping our nation’s domestic politics, it is a virtual certainty that Mr. Obama’s Republican opponents will work overtime to prey on the differences between Obama and the military by favoring the military over the constitutionally designated Commander in Chief. We can therefore expect the friction that is already paralyzing our grand strategy to increase catastrophically over the next year. Boyd argued that five criteria should underpin a sensible grand strategy — decision makers should shape domestic policies, foreign policies, and military strategies so that working in harmony they serve to: 1. strengthen up our resolve and increase our internal solidarity; 2. drain away the resolve of our adversaries and weaken their internal cohesion; 3. reinforce the commitments of our allies to our cause and make them empathetic to our success; 4. attract the uncommitted to our cause or makes them empathetic to our success; and 5. end conflicts on favorable terms that do not sow the seeds for future conflicts. But it is obviously difficult to define policies that simultaneously conform to and strengthen to all these criteria. The challenge is particularly difficult for the unilateral military strategies and the coercive foreign policies so popular with the foreign policy elite and military strategists. Military operations and political coercion are often destructive in the short term, and destructive strategic effects, however successful in the short term, can be in conflict with and undermine the larger aims of grand strategy, which should be constructive over the long term. With the widening destruction in increasing deaths of non combatants attending to the escalation of the so-called counterterrorism strategy, it is now becoming clear that the destructive effects of military strategy are displacing the long-term possibility of a constructive grand strategy in Afghanistan. At the moment, however, the decisive importance of what is fundamentally a mental and moral break down at the highest level of grand-strategic decision making is being masked by narcissistic jingoism about supporting the troops whom the paralysis is keeping in harm’s way; by claims of bringing democracy to an incurably corrupt and mafia-like Afghan government; by making feel-good humanitarian pronouncements like improving human rights of the Afghan people (especially women), while we are killing them inadvertently and deliberately destroying their houses; and most importantly, by fanning the fears of terrorism in the hearts and minds of an increasingly insecure American people with absurdly unprovable claims that taking the war to our enemies in Afghanistan (and Pakistan, Yemen, Somalia, and god knows where else) will protect us at home. The second salient factor in this dispute over withdrawal dates is that the divisive goals of the US decision makers have made us prisoners to the decisions and actions of the Taliban — seasoned fighters, who, after nine years, must sense a victory that for them is simply and clearly defined: namely, forcing the foreigners to leave, which has the added moral leverage of being a variation on the conflict over exit strategies between President Obama and his Generals. The U.S. leadership would be well advised to remember the elements of pride and xenophobia in Afghan culture. The culture has been shaped morally and mentally by the warrior traditions of honor, revenge, and fidelity to religion. Afghans are still proud of the fact that they forced Alexander the Great to leave on their terms. They are proud of the fact that they defeated the British Empire twice at the height of its imperial power in the 19th Century. They proudly believe they were the shock troops who destroyed the atheistic Soviet Union. Now just imagine how the Afghan warriors would view themselves if they managed to pull off the even greater achievement of forcing the infidel Americans to leave. So it is reasonable to assume that the fangs of the Taliban and its local allies are out and that they think they are winning, a mental state, which as any competitor knows, increases one’s determination to win. Now contrast this kind of strength of will to that of Mr. Obama or General Petraeus: the outcome of their Strategic Review certainly does not sound very triumphal, when decision-makers and pro-war editorialists admit our gains have been fragile, but claim we are making progress toward achieving our goal of leaving. Does anyone really believe the pusillanimity so evident in this kind of language will be lost on the battle-hardened leaders of the Afghan insurrection? The third salient factor in the dispute over when to leave Afghanistan is that too much water has already flowed over the dam. The Afghan war is now nine years old, and the situation appears worse today than in December 2001, when President Bush and his military minions mistook a strategic dispersal into the hinterlands for a rout. Initially welcomed by the Afghan people, the United States has managed to turn the Afghan tradition of hospitality on its head by imposing our alien ideas of a top-down central government on a traditional bottom-up decentralized tribal vendetta culture, conditioned by 3,000 years of history. Moreover, in so doing, we placed many of the same corrupt murderous warlords in power the Taliban had ousted, and we have escalated the destruction of lives and property attributable to our increasingly unwanted foreign presence. Anyone who thinks we can successfully reverse the deep feelings of alienation and revenge caused by these missteps in a few years time is hallucinating. Fourth, after nine years of futility, time is also running for Mr. Obama and his strategic minions, because exhaustion is setting in. The American economy is in crisis, thanks in part to the destructive policies of the Bush Administration, but also due to much deeper roots reaching back at least to the 1970s. The great American middle class, the engine of our economic dynamism, is being impoverished as the gap between rich and poor continues to widen to levels not seen since the days of the robber barons. Our economic power is enervated by deregulation, corruption and fraud, particularly in the financial sector, but also in the manufacturing sector, which has been decimated by deindustrialization. Total private debt in relation to GDP stands at a record level. The American population is aging, yet its social safety net is shredding. The infrastructures needed to support a modern economy — education, transportation, sewers, power networks, etc., are either obsolete or in a state of decay compared to those of our economic competitors in Europe and Asia. Sooner or later, the American people will tire of shoveling money overseas, because there is so much to do at home. Recent polls suggest that sooner is more likely than later, because 65% already want to end the Afghan war. Surely, our adversaries in Afghanistan sense America’s growing exhaustion. For inwardly-focused decision makers in Washington to assume otherwise is to deny reality. In the end, the crisis boils down to a failure of orientation — a breakdown in the mental filter through which decision makers interpret their observations of the external environment. When this happens, decisions and actions become disconnected from reality, which then fold back on themselves to widen the mismatch further. Mullah Omar recently attributed Richard Holbrooke’s heart failure to stress. Whether true or not, Omar opened a window into his grand-strategic orientation by making this statement — and it is more in tune with his environment than that of his adversaries. In classic Sun Tzu fashion, honed by centuries of experience in expelling invaders, Omar told us his goal is to wear us down by keeping us under constant pressure. As William E. Polk showed in his profoundly important book, Violent Politics: A History of Insurgency, Terrorism, and Guerrilla War, from the American Revolution to Iraq, the historical fact is that the only combatants who ever benefit strategically from protracted war of insurrection are the guerrillas who are trying to expel foreign invaders. In contrast to the outward orientation of Mullah Omar, the dispute over when to leave shows that orientations of President Obama and his military have turned inward toward protecting themselves, their careers, and their reputations. With differences in outlooks like this, the grand-strategic writing is on the wall for all to see.